If you’re lucky you won’t start to go bald until later in life, however, many lads have to face this problem even in their twenties. So don’t be too quick to panic that you’re entering your golden years if you’re starting to thin out on top. Believe it or not, there is such a thing as going bald with grace, just choose a hairstyle which makes your receding hairline work for you. If the full shave is still a little intimidating, why not try the classic buzz cut? 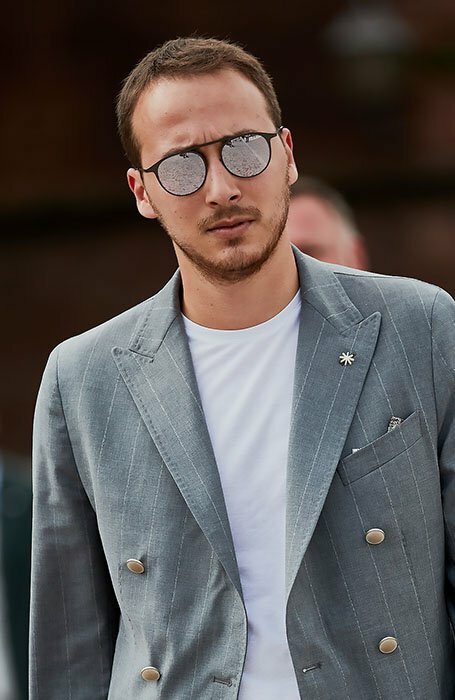 This is a simple and masculine hairstyle that looks great if your hair is beginning to thin around the crown and the hairline. It helps to minimise the appearance of a receding hairline or widow’s peak by drawing attention back to your face. 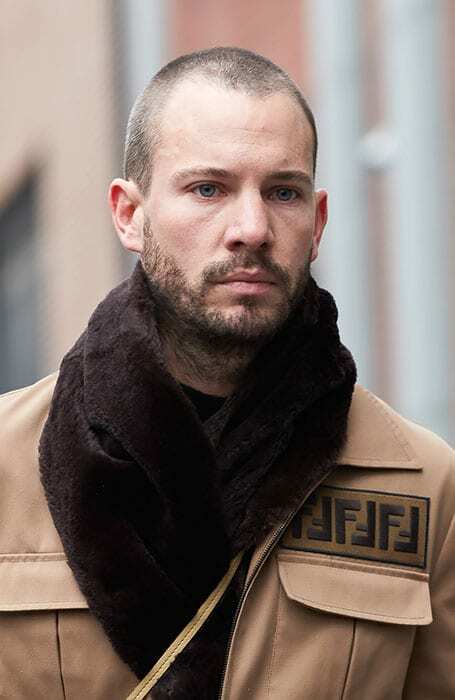 The crew cut is one of the most popular hairstyles for men with or without a receding hairline. It works the same way as the buzz cut to draw attention away from your widow’s peak and back to your face. But with the crew cut, you get to retain more hair length up top. 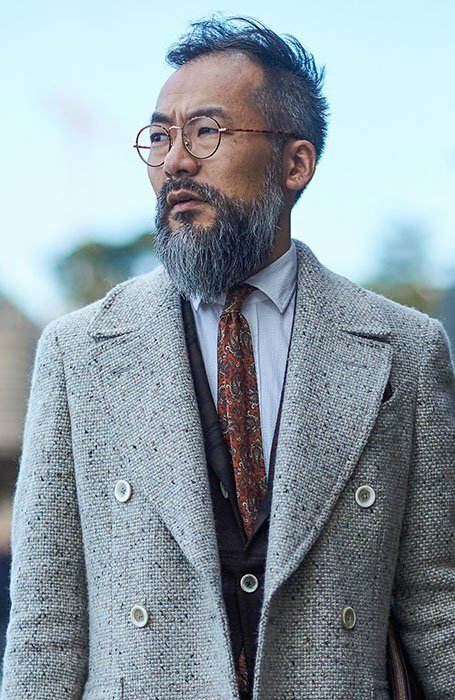 This is a great hairstyle for those going bald at younger ages or if you want to keep your hair a little longer. The razor shave is the ideal haircut if you have bald spots or patchy hair. 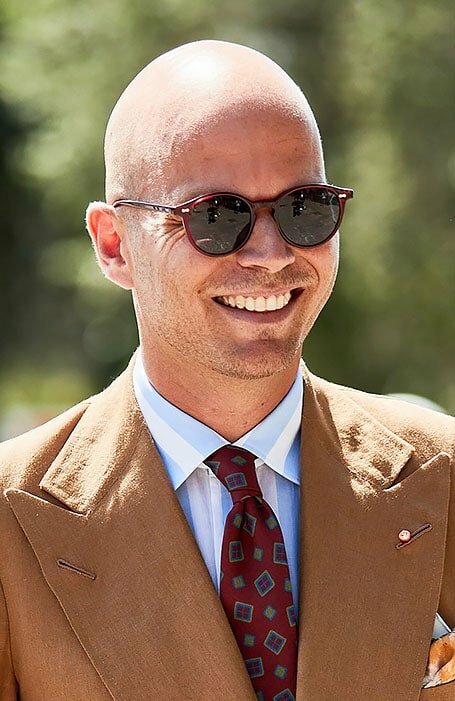 While going the full shave may seem daunting, it looks far better than gradually losing your hair patch by patch. The razor shave will keep you looking clean cut and distinguished while also maintaining a masculine style. Plus you’ll no longer have to bother doing your hair at all. 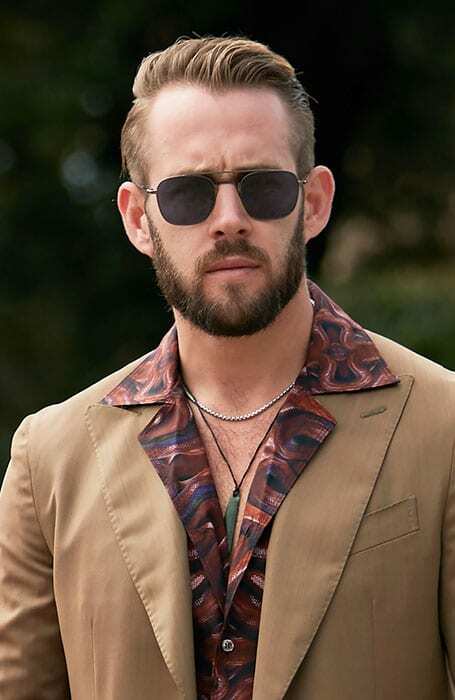 If you’re unfamiliar with the ivy league style, think Ryan Reynold’s collegiate cut, and yes, even Deadpool himself has a receding hairline. 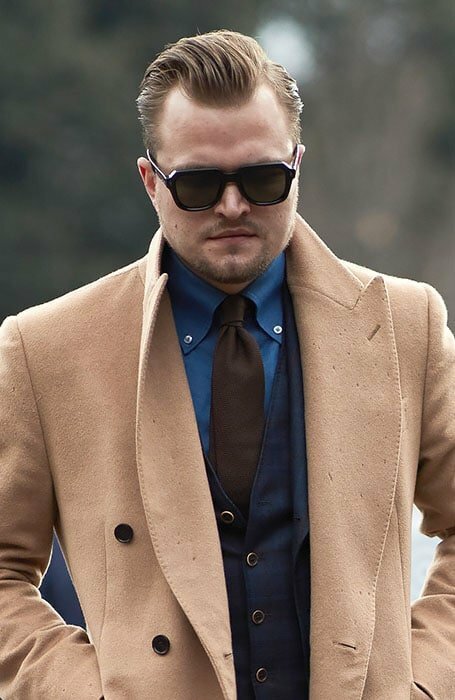 This dapper style is the perfect way to combat your creeping hairline but is best for those of you who still have a bit of volume left throughout your mane. 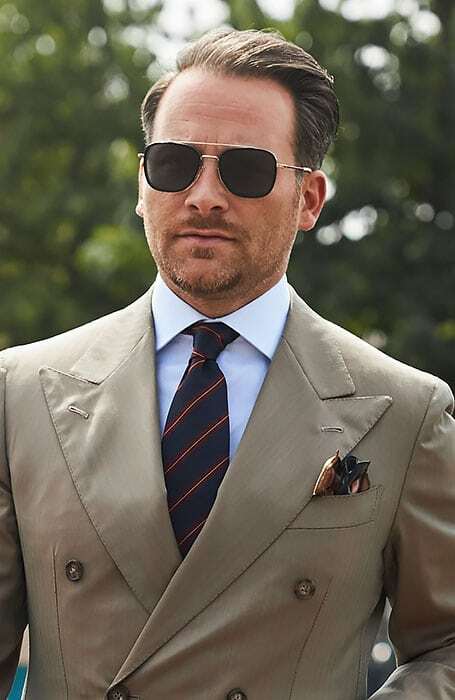 The slicked back look became hugely popular in the late 20th century and is still the go-to style for many men. It is a great way to draw attention away from your receding hairline. Just grab a comb and some product and slick your hair towards the back of your head from the front. Set with a little hairspray and be careful not to overdo it with the product to avoid the hair looking greasy. 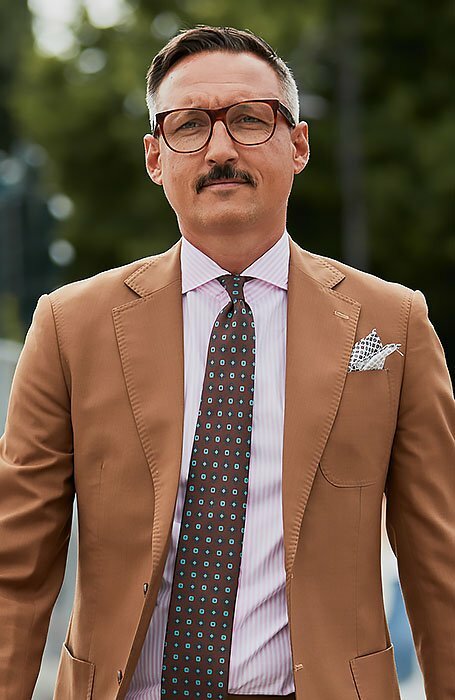 The comb over hairstyle is excellent for men who are balding as they incorporate the receding hairline into the style, using it as the lowest point in your hairs natural part. This gives the illusion that your hair is thicker and more weighty. Have your hair cut so that it is a little longer at the front. Style using a small amount of product, comb your hair back and to one side and set with some hairspray. There are a lot of styling opportunities when it comes to tapered cuts. The quiff, like the pompadour, works better with a little extra length on the top of the head. 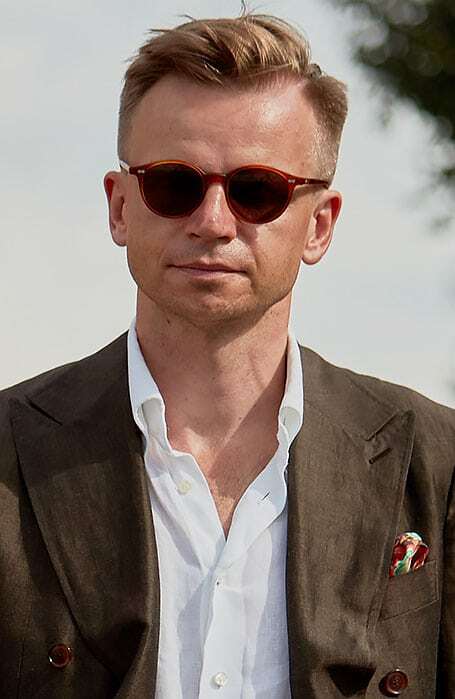 The quiff is a particularly attractive hairstyle and will make you appear younger as well as distinguished. This youthful look also works to detract from any signs of receding or thinning hair. Like the buzz and crew cut, high and tight is another military-inspired haircut. 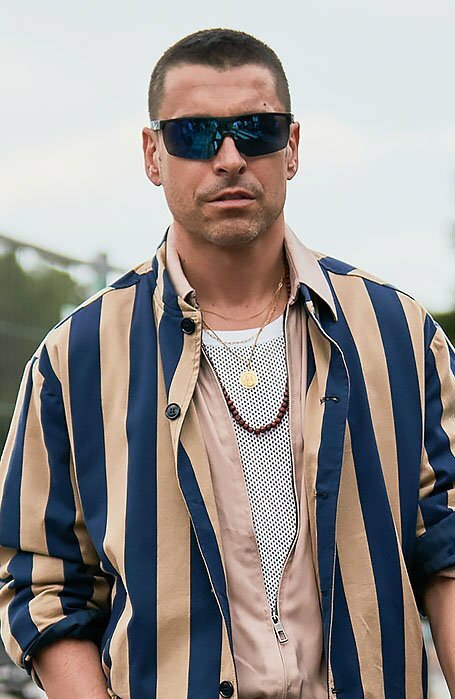 This means it may not be the most versatile cut in terms of styling, but it is functional, easy to maintain, masculine and will help to hide the signs of balding. 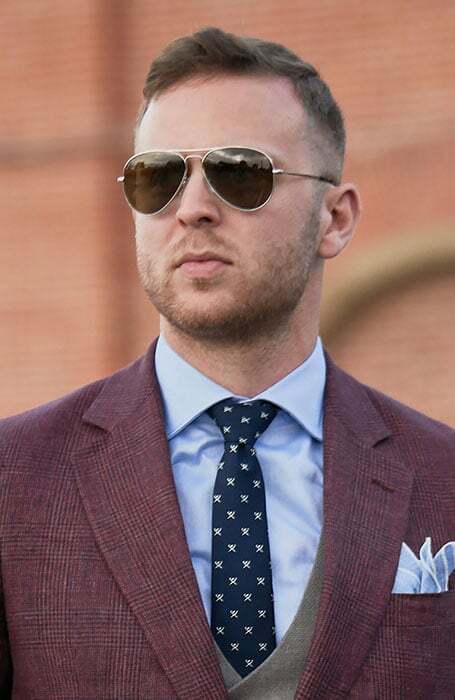 High and tight cuts are cropped and faded to a very short length on the sides with a longer patch of hair left on the top. This draws attention away from the hairline and back to the longer hair. It also helps define facial features which distract from thinning hair. A skin fade with short hair is an edgy cut which allows you more control over styling and the overall look of your receding hairline. 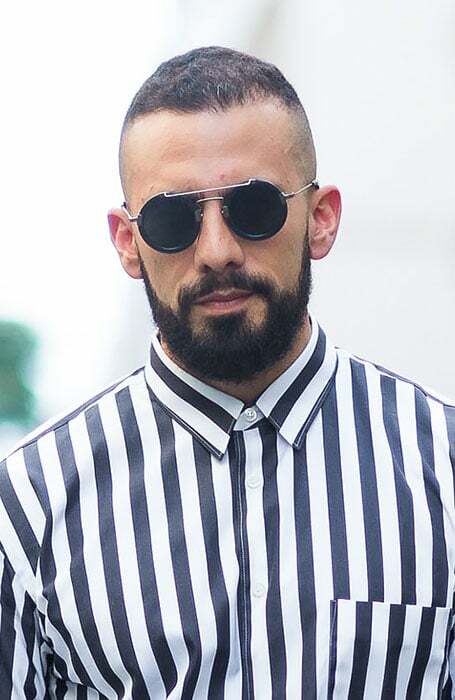 The shaved sides and tapered length provide a modern aesthetic, which makes you look younger. This cut also draws attention away from your hairline and to the longer hair at the top of your head. 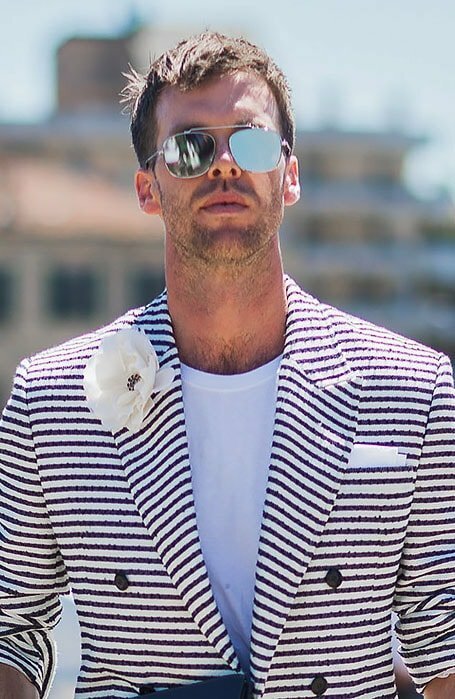 This style will work better if you’re still in the early stages of balding. Any slicked back styles are great for men with receding hairlines and widow’s peaks. Having your hair off your face helps define your facial features and makes you appear more chiselled. The slicked back comb-over is sleek, sophisticated, modern and is the ideal hairstyle to edge up a formal look. 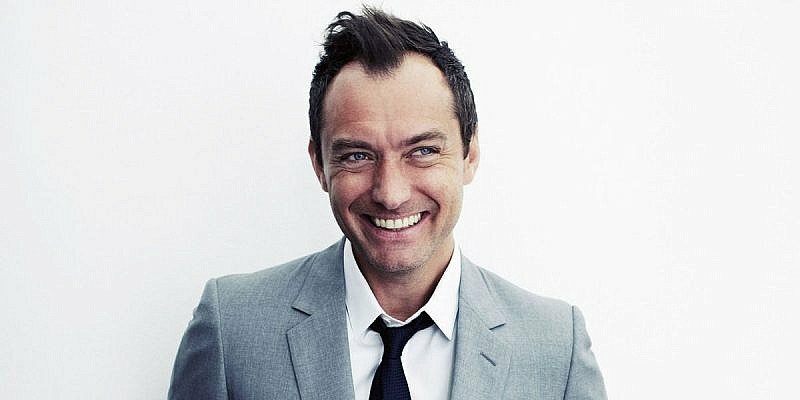 A faux hawk is great to draw attention away from your receding hairline while also being a youthful and edgy hairstyle. Don’t go too crazy with the length though, keep it shortish at the top and achieve the height by spiking it up using a bit of product. Keep the hair neat at the sides, either in a fade or slicked back in one direction. The butch cut involves the hair being shaved so that it is all the same length. Generally, it is cut between 1⁄4 and 3⁄4 inches and follows the contour of the head. 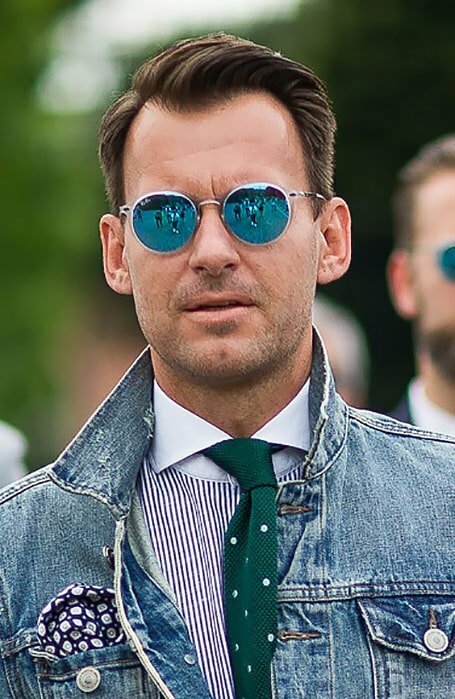 This style should make it so that your receding hairline is barely visible while creating a masculine and clean-cut look which is also super low maintenance. 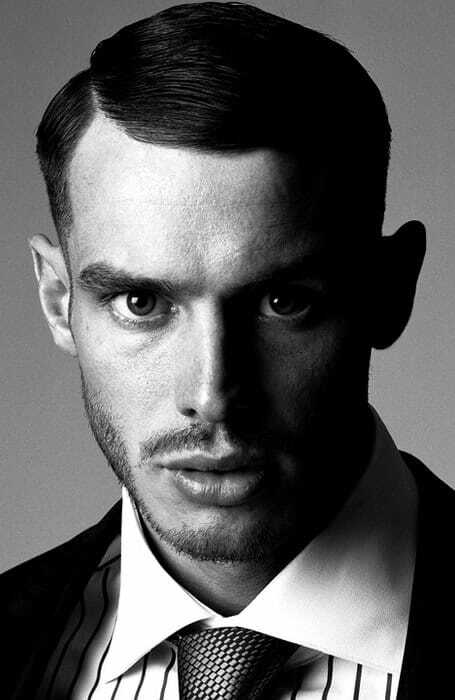 If you’re after a dishevelled hairstyle to conceal your receding hairline, then a short and messy cut is for you. After showing, apply some pomade and dry your hair with a towel. This will create some natural texture for a messy, just rolled out of bed look. A taper fade involves taking the sides of your hair short and gradually fading them downwards into bare skin. You will want to keep some length on top and roll the hair back into a pompadour. This will soften the appearance of a receding hairline or widow’s peak. The regulation cut is also a take on a traditional army hairstyle which became popular during the days of World War 2. The look involves the hair being very short at the sides, either tapered or shaven completely. The top if the hair is almost styled into a comb over, but kept tighter. Much like many comb over styles, the regulation cut incorporates your hairline into the style using it as a feature of the hairs part.